Squatchin’ with the Daughter: Expedition 1. I’ve aways been fascinated with Bigfoot. I first learned of the creature when I was five years old, from a cousin who was eight. I hope you’ve all had a cousin like this one, who is just enough older than you that everything they do is cool, and there is no one in the world you’d rather be hanging out with. My cousin is another story, which I will eventually tell, but the point is, I first learned about Bigfoot when I was five. The idea that there could be a real, live monster in the woods, the nearby woods was at once terrifying, exhilarating, and altogether irresistible to my child’s mind. I absorbed every book I could find on the subject (and there were, and still are, quite a few). As I grew up, my feelings and opinions about Bigfoot certainly evolved and changed, but I have always found the lore and the stories and also the characters intriguing. I have always been interested in what Bigfoot and “Bigfooters” were up to. Time went on, and I ended up with a daughter. To my surprise, she actually became fascinated with Bigfoot as well, and it became something that she and I could share. Unsurprisingly, it was something that was pretty much just for the two of us. Her Mom thought it was cool, but wasn’t particularly excited about it in her own right. So it happened that in the summer of 2012, when Maile was getting ready to turn seven, and tall enough to sit in the front seat of our pickup truck, that we decided to take a camping trip to Northern California, for the express purpose of looking for Bigfoot, an activity which is sometimes known as “Squatchin’”. For me, the trip would be something I’ve dreamed of doing since I was a little kid. For most people, places like Happy Camp, Orleans, Hoopa Valley, Weitchpec, and Willow Creek are somewhere between insignificant little dots on a map, and utterly meaningless. For me, though, those places were as exotic as anything in Egypt, India, France or Zanzibar. Those were the places where the history of Bigfoot was made. Legendary Bigfoot investigators like John Green and Peter Byrne told stories of organizing their expeditions in the lobby of the Orleans Motel, and having eggs and coffee in the attached diner. When Roger Patterson and Bob Gimlin made their famous film of the creature, they immediately ran to Al Hodgson’s store in Willow Creek, with the announcement, “I got a picture of the son-of-a-buck!” To me, this was history. Like a civil war buff exploring the battlefields of Virginia, this was visiting the birthplace of Sasquatchery. 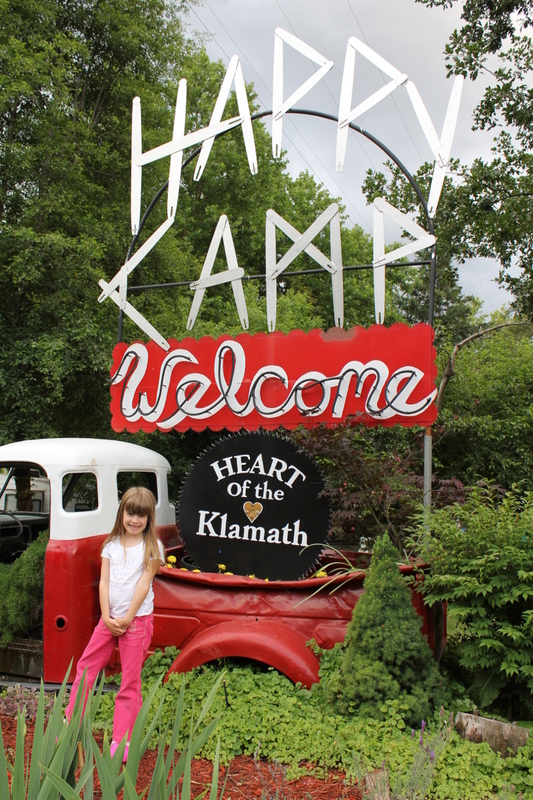 I was thrilled, and Maile was excited about going on our first “Just the two of us” camping adventure. The ultimate goal for our expedition was to visit the site of the most famous of all Sasquatch encounters, Bluff Creek. 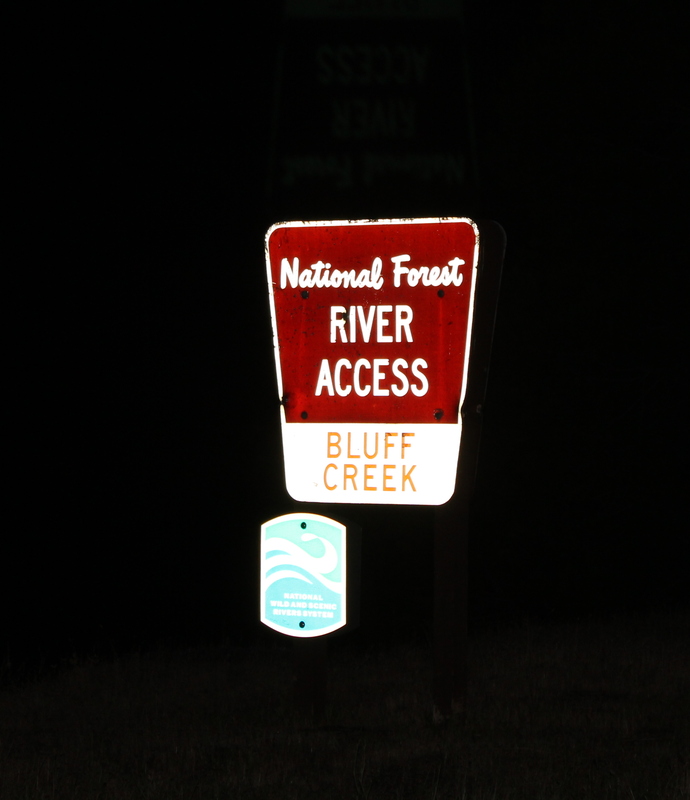 For those who may not be aware, Bluff Creek was where Roger Patterson and Bob Gimlin made their famous 16mm film of a figure moving across a creek bank and into the woods. If the film in fact does show a living creature, it is by far the best film yet taken of a Sasquatch. If it in fact shows something else, well, that story has got to be almost as interesting. Maile in the truck, ready for adventure! In any case, we were both absolutely giddy at the idea of being where it happened, whatever it was. 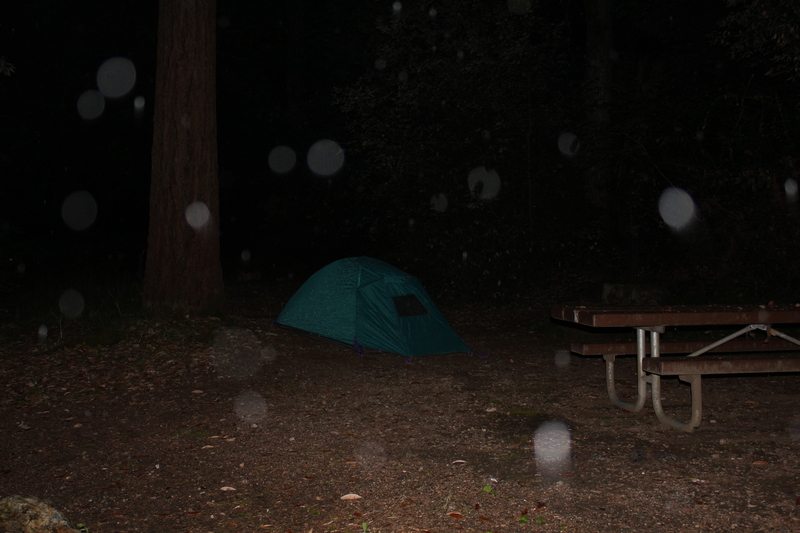 So it was late on a clear summer morning when we loaded up the truck and headed south on Interstate 5, with my smartphone’s GPS pointed at a campsite a mile outside of Orleans. I absolutely love navigating by way of Google maps. The route Google picked for us stayed on the interstate just as long as it needed to, then sent us out on a beautiful set of two, and sometimes one-lane roads, traveling through farm country, along the back side of mountains, and through the tiniest of communities. Through the whole journey, Maile alternately looked out the window at the world going by, turned toward me to share observations, and snacked. For her,it was clearly a great way to spend a few days of her summer vacation. We climbed into fog banks clawing their way up the slopes of the hills, which brought a welcome cooling to what had become a pretty hot day in Southern Oregon. The closeness of the fog, as well as the denseness of the woods around us gave us a the feeling that all kinds of animals could be living here, just out of sight. This was where Maile and I had our first conversation on the topic of pareidolia, which is the process by which one’s mind imposes recognizable shapes on things like clouds, or fallen logs, shadows, that kind of thing. We played with the idea for a while, finding things like dead horses in rotting logs at the side of the road, and fairy princesses in the tops of pine trees. We also agreed that this might be how a lot of people think they see Bigfoot. If you ever want to bring fruit into California this is where to do it! Having crossed the border from Oregon to California numerous times, I was prepared to at least answer the “Do you have any fresh fruit?” question. The way we went, the border was represented by a slight difference in the texture of the asphalt, and demarcated by a line that had clearly been made by a can of spray paint, with “CAL” sprayed on one side and “OR” on the other. 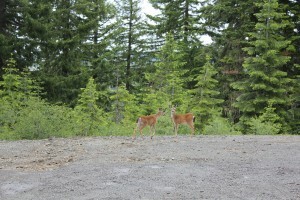 This was also where we had our first wildlife encounter. 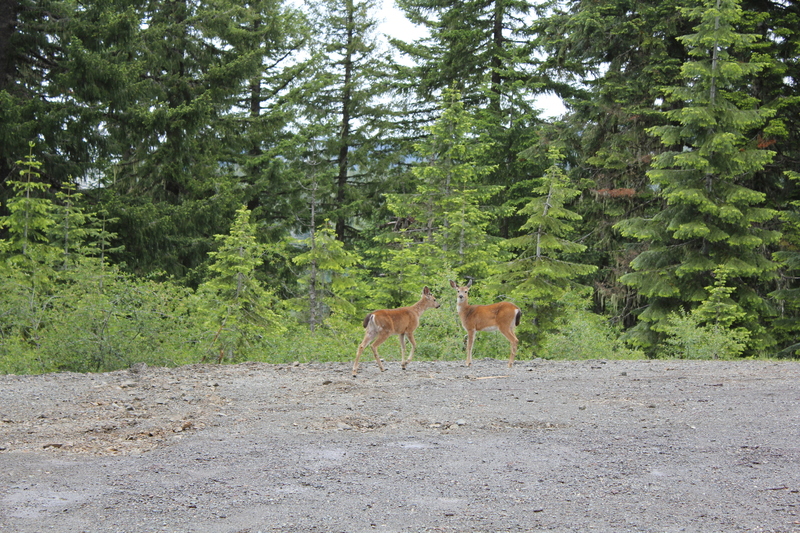 Two deer were playing together, and didn’t seem to mind at all having their picture taken. It was about this point that the clock started to get involved in our story. We had crossed into California, and were pretty close to our destination, but it was starting to get late. That was fine, but I was hoping to be able to set up camp before it was completely dark. We weren’t able to make reservations for the campsite, so as far as I knew, the place could have been completely full, and then we’d be looking around after dark for someplace to sleep. Happy Camp, the official start of Bigfoot Country! We came out of the mountains at Happy Camp, which is, by all appearances the northern border of Bigfoot Country. This is where we saw the first of many statues of Bigfoot that we would see over the next couple of days. From Happy Camp, we took Highway 96 – “Bigfoot Highway”, according to the signs, and a beautiful drive – South to our campsite at Pearch Creek, which is just about a mile outside of Orleans. It’s official: USPS says it’s Bigfoot Country! 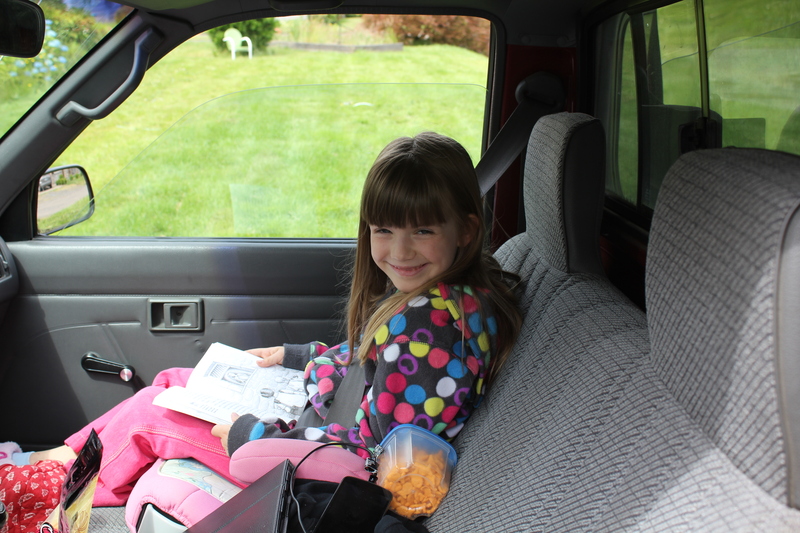 About this time, I noticed that every few seconds, Maile would turn around in her seat and look behind the truck. I asked her what she was doing, and she said she wanted to see if any Bigfoot were stepping out of the woods behind us. So far, there hadn’t been any. We made it to the campsite just as dusk was getting serious, and saw, to our great relief, that except for one other group, we had the place to ourselves. The creek was nearby, and we could clearly hear the water running. We made camp, freshened up a bit, and had a quick dinner from the supplies we had brought along. 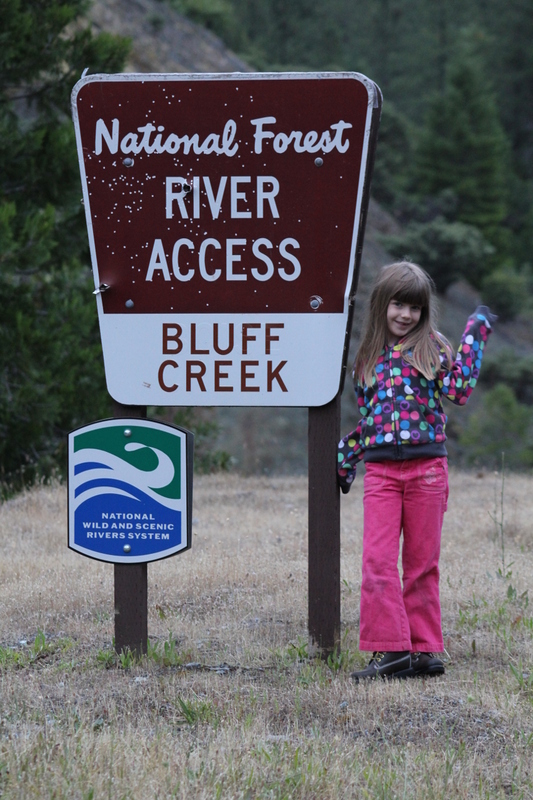 At this point, I played the Dad card, and informed Maile that we were going to take a little drive up Bluff Creek Road. It was still early in the evening, and I had waited so many years to be here, and I wasn’t going to wait any longer. 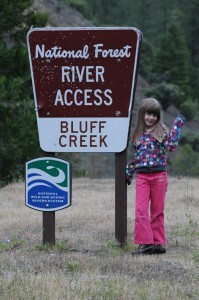 Over a very mild objection from Maile, we piled back into the truck, and headed south toward the Bluff Creek Bridge, and Bluff Creek Road. 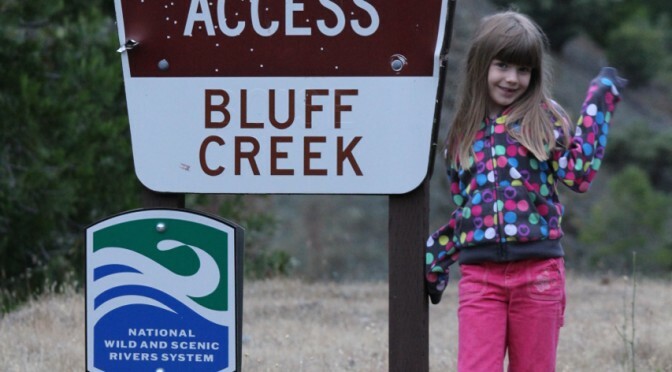 The “old” bluff creek road has been closed to vehicular traffic for nearly the last 40 years, after an enormous flood came through the area, washing out, among other things, Bluff Creek Road. The road is still accessible by foot, and I am told it’s actually a nice hike. I’ll let you know in the not-too distant future. The new Bluff Creek road is a single-lane, paved road that meanders up the side of a hill. 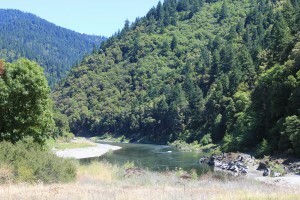 Occasionally, the trees on the right hand side give way to majestic views of the creek, and the canyon through which it flows. Of course, this is what you discover in the daylight. When we took this frist drive, it was definitely night time, and the sky closed in like it only can when you’re deep in the woods. I was nearly giddy with excitement, but Maile was getting progressively more nervous as we drove on. Her looks behind the truck were getting more frequent, and I could tell it would quickly be time to head back. The road is so narrow, and the shoulders of the road so steep, that we really needed to find some sort of intersection in which to turn the truck around. It was several more minutes before we finally came across a gravel double-track heading off to the left. We turned around here, and only then realized just how steeply the road had climbed. I rode the brake most of the way down, and as we descended, so did Maile’s nervousness. We headed back to camp and climbed into our sleeping bags inside of our tent. I know it won’t be forever, but I surely do enjoy that my daughter sometimes still likes to fall asleep in my arms. The sounds of the forest kept my sleep light. Far off in the distance, I could hear a group of animals that sounded distinctly canine. I figured they must have been a pack of coyotes. They were were yipping and barking, and carrying on for what seemed like hours, like they were having a real rager of a party. Eventually, though, something that sounded like a much, much bigger animal half growled and half roaredat them. Suddenly all was quiet except for the rush of the creek. I have way too little experience with the wildlife in the area to even begin to wonder what kind of animal can tell a bunch of coyotes to shut up and get results. 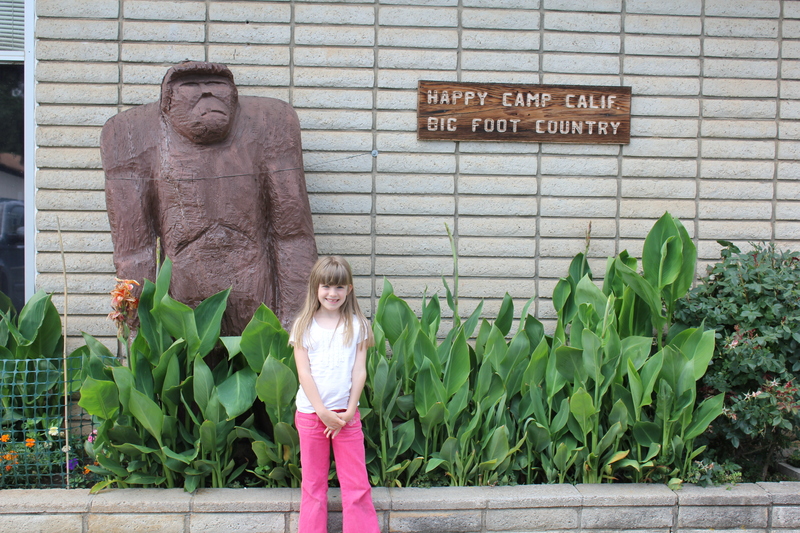 Of course, we were in Bigfoot’s home town… We both woke at almost exactly five in the morning. There was no point in trying to sleep in, so we got an early start on our day. I figured we’d make another run up Bluff Creek Road, this time in the daylight, and then look for someplace to get breakfast. I figured Willow Creek would be a good place to find a greasy spoon diner. With all the outdoorsy stuff around, I figured there had to a place where everyone stopped for eggs and coffee before the Big Fishing Trip. Bluff Creek Road in the light and fog of early morning was a completely different experience than it had been the night before. The way the light angled through the trees was gorgeous, and when the forest parted along the edge of the road, the view of the creek and canyon were absolutely breathtaking. 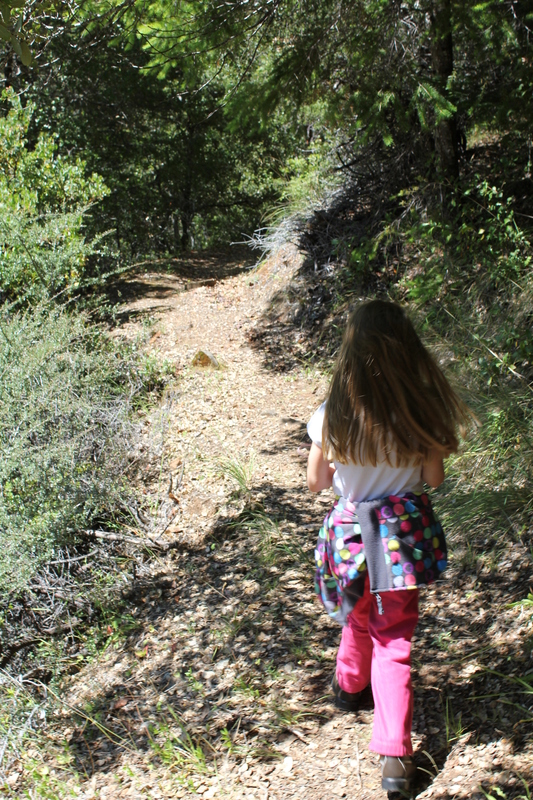 Six miles up the road, we came to an intersection, and Maile was getting hungry, so we headed back down the hill, and turned south toward Willow Creek. Once again, we were treated to some absolutely beautiful scenery as we wound our way past Weitchpec, Hoopa Valley, and finally, 38 miles and an hour later, into Willow Creek. It was still early, barely 8:00 am when we rolled in, but we didn’t find much that was open. There was a home center and a grocery store, but the diner I was hoping for was nowhere to be found. Fortunately, there was a cell tower nearby, so I was able to consult Google for nearby eateries. Several places advertised breakfast, but turned out to be closed when we went by. Even a very promising-sounding place called The Early Bird turned out to open at 11:00. Eventually, we were able to find a coffee bar that was open, where I had an uninspiring latte, and Maile had a powdered donut that she claimed she didn’t enjoy. I noted that the muffin selection in the case looked awfully familiar, and I deduced that there must be a Costco nearby. Since nothing else looked like it would be open for another three hours or so, we decided to go back up north. I was hoping that the diner I was looking for would turn out to be the Orleans Cafe, where so many hopeful Bigfooters had certainly gotten coffee before us. Sadly, the paint on the “For Lease” sign at the Orleans motel and cafe had clearly been peeling for a number of years by the time we rolled in. Disappointed, we stopped by a rather ominous-looking market, where we were informed that apparently there were no restaurants within a couple hundred miles. We left there in a bit of a hurry. We finally threw in the towel and headed back to the campsite, where we had another meal of the supplies we had brought with us, then headed back to the Bluff Creek bridge. Highway 96 crosses Bluff Creek where it drains into the Klamath river, and there is a small area at the side of the road where a handful of cars can park. From this spot, there is a trail descending 40 feet or so to the river bank, and in the other direction, across the road, the Bluff Creek Historic trail climbs the steep hill into the woods. We were the only visitors that day, and by noon, the sky was clear, and the temperature was now quite warm. Since our goal was to try to get to the Patterson/Gimlin film site, which we knew was upstream, we decided to take the Historic trail. Maile and I heading back down the Historic Bluff Creek Trail. 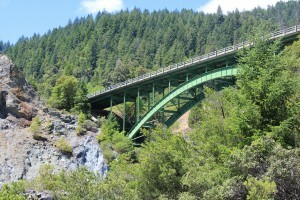 Highway 96’s bridge over Bluff Creek. At the bottom of the short trail down from highway 96. 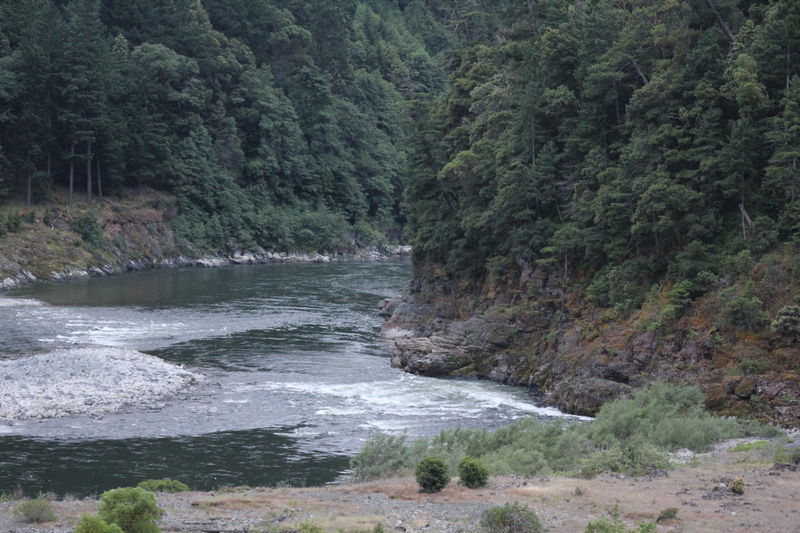 This is the Klamath river where it absorbs Bluff Creek. 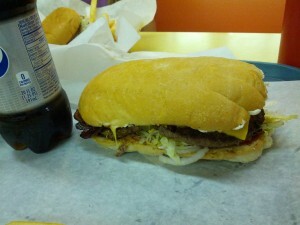 The Bigfoot Burger: a ginormous bacon double cheeseburger. Bigfoot Burger, the place is your basic locally-owned fast-food and take-and-bake pizza restaurant. Also not uncommon for such establishments, the back half of the building was a hunting and fishing supply business. While we were getting sodas out of the refrigerator case, the woman working the counter took a break from taking food orders and walked across to sell a box of ammunition to a guy who had been waiting patiently. Along one wall was a rather surrealistic, almost Dali-esque mural depicting a couple of Bigfoot cooking donuts over a campfire and happily cavorting about. It’s pretty adorable and heartwarming. Maile and I had a quick meeting of the minds, in which we discussed the fact that she likes her burgers plain and dry, with nothing but lettuce, and the Bigfoot Burger has stuff like bacon and cheese on it, so it would have been tough to split. So she got a regular kids burger and I had my biennial cheeseburger. 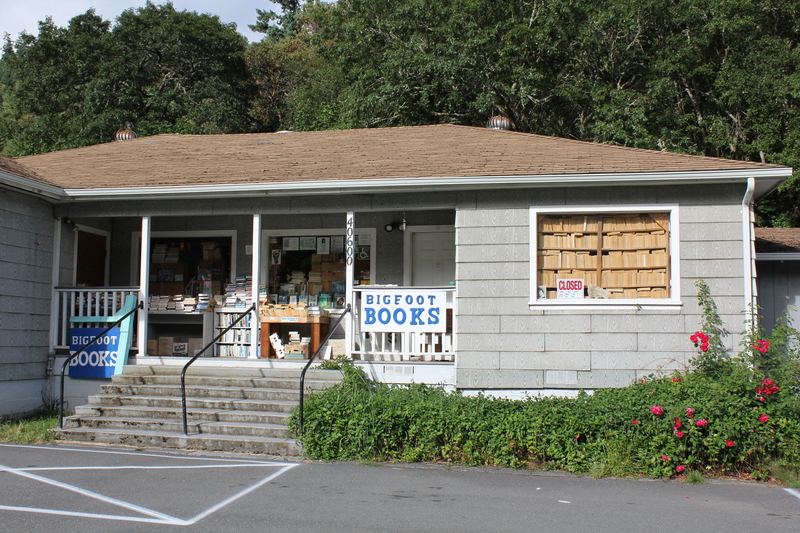 With that done, we walked across the parking lot to Bigfoot Books, where we met proprietor Steve Streufert. Bigfoot Books reminds me a lot of Wallace Books, the bookstore owned by my lovely wife. Both stores are located in structures that were once someone’s home. Both are covered in sagging pine shelves with stacks and stacks of books which appear chaotic, but are actually very highly organized, just according to a non-obvious, highly complicated system. The stacks generate a wonderful sense of adventure with great promise of serendipity. The crisp scent of aging paper is the final element of the true new-and-used bookstore “cred”. 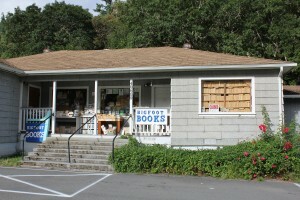 Bigfoot Books in Willow Creek. Steve and I talked for a couple of hours, where I apparently answered a lot of questions correctly and passed some tests. Steve is what I would consider a “Skeptical Believer”, which is, I suppose, how I would categorize myself. If there is a large, ape-like creature walking around in the woods, I am not willing to ascribe to them powers or abilities beyond those of normal animals, except perhaps an above-average ability and instinct to avoid contact with people. I am also dubious of claims coming from campers who have all kinds of seemingly extraordinary experiences on their first night or two of camping in the area. It’s awfully easy to hear a barred owl and think sasquatch. Steve seemed to be on the same page. It was a good conversation, and I walked out a couple hundred dollars lighter, but heavier by a big stack of books. Steve was also quite generous with his knowledge of the area, particularly the Patterson/Gimlin film site, a subject on which he has particular expertise. He also set my mind at ease regarding the local bear population. It seems they are under very little stress within their environment, and as such have no real interest in people or their belongings, and generally tend to avoid them, or walk casually away if they happen across someone. That made me feel a lot more comfortable about camping and tromping around in the woods. What really left me impressed, though, was the depth of knowledge that Steve possessed on the topic of Bigfoot. In all the years I’ve been an avid reader and student of the subject, occasionally even chatting with some of the very big names in the field, I’ve never felt so much like I’d brought a knife to a gunfight as I did talking with Mr. Steven Streufert. This guy really knows his stuff! By this time, it was getting to be late afternoon, and I think we actually kept Bigfoot Books open after normal closing time. 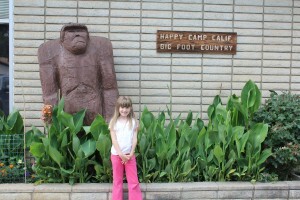 Maile and I returned to the Bigfoot Motel and watched some of the Bigfoot movies we’d brought with us. We shared a bag of Trader Joe’s kettle corn, then turned in. The next morning we got a late start, then stopped by the Bigfoot Museum on the way out of town. The China Flats Museum, Bigfoot Collection with one of Willow Creek’s many gigantic Bigfoot sculptures. 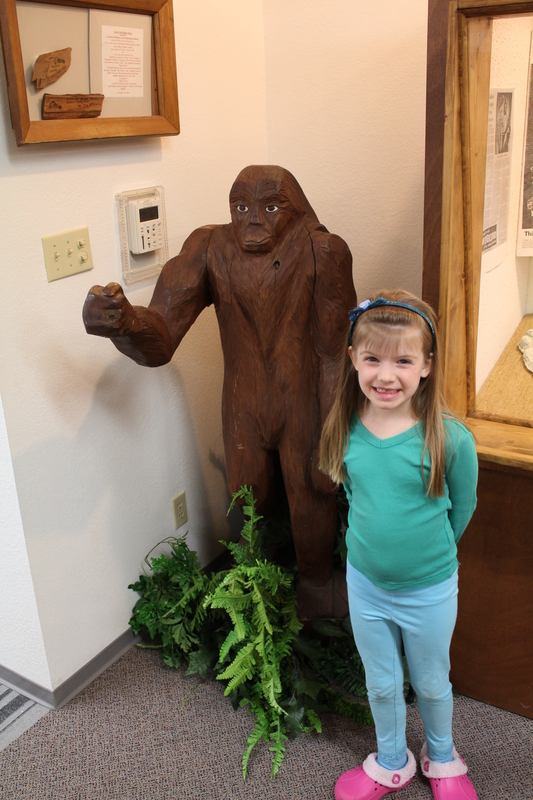 The museum is not solely dedicated to Bigfoot; it contains a number of exhibits related to the history of the area, including some pretty impressive heavy mining equipment, some interesting blacksmith’s tools, and other early mountain-living related items. The back room, though, is like no other room anywhere in the world. The back room is, of course, the Bigfoot room. Here you will find a collection of original tracks that has no equal anywhere. I had been seeing photographs of these casts all my life, and now I was looking at the genuine articles through a single sheet of glass. To my mind, there are two general levels of items in the Bigfoot Collection. The first, higher level are the one-of-a-kind, actual pieces of history. 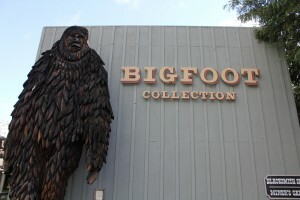 The second tier consists of often pristine examples of “Sasquatchiana”, Bigfoot merchandise, and other pieces representing Bigfoot as a cultural and mass-market phenomenon. This is one seriously big statue! The first category is absolutely amazing. There are original casts made by Roger Patterson of the tracks left by the creature he managed to film. 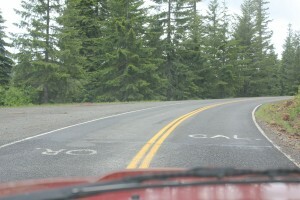 There are casts of the tracks left on the Bluff Creek road construction site which had originated the name “Bigfoot”. There is case after case of tracks from all over the west. There is a set of “Cripple Foot” tracks. There were original clippings from the Humboldt Times, written by Andrew Genzoli and Betty Allen. An original copy of the famous 1968 Argosy article about the Patterson/Gimlin film was on display. I got a slight chuckle out of a gigantic speaker with “BFRO” stenciled on the side of it. It reminded me a lot of the speaker Jake and Elwood mounted to the top of their former cop car in The Blues Brothers. In reality of course, it had been used for “Call Blasting”, a practice that involves broadcasting recordings of Bigfoot vocalizations through a gigantic, usually car-mounted speaker. The idea is to elicit a response from any Bigfoot that might be in the area. The second tier was also unusual and amazing. There was a case full of examples of Bigfoot related toys and games (I’m now on the lookout for a LEGO “Yeti’s Hideout” set!). I took just a little pride when I saw the one-sheet poster advertising Sasquatch: The Legend of Bigfoot. I’ve got the same poster hanging in my media room. There was a boardgame I had as a kid, called (what else?) Bigfoot. Inside the Bigfoot Collection, China Flat Museum. For a Bigfoot enthusiast, this is like Cooperstown, or in my case, the front room of the Smithsonian Air and Space museum. We spent about an hour poring over the Bigfoot collection, then stopped by the gift shop for some souvenirs. I got a copy of a track originally cast by Al Hodgson, and Maile got a stuffed Bigfoot, which she promptly named “Patty”. That’s my kid! It was getting close to noon, and time for us to start heading home. It was a great trip. Maile and I got to share a great adventure, and I realized a lifelong dream, but it wasn’t completely successful. I had really hoped to find the film site, or at least get close. I was hoping to spend some more time actually hiking in the woods, and I certainly hoped to spend less time driving over the same 50 miles of highway over and over again. What I did get, though, was a basic idea about the “lay of the land”. I learned where things were, where to stay, where to go for supplies, how to get around the area, what to be worried about and what not to sweat. 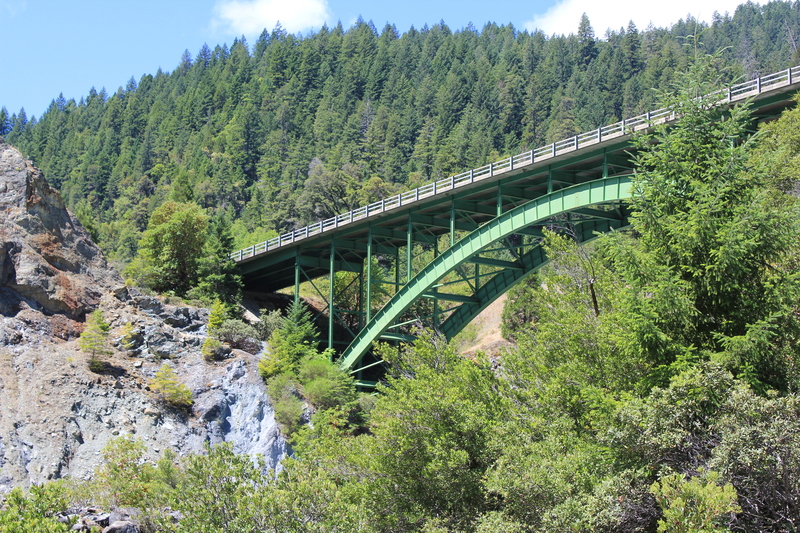 I have begun looking at our NorCal Squatchin’ adventures as being something like the Apollo Space program of the 1960’s: the first few missions were about proof-of-concept, and figuring out if we could even accomplish what we had set out do. Next time – and there will certainly be a next time – we will make it to the film site, explore Bluff Creek much more thoroughly, hike much more and drive less than the previous trip, and who knows, maybe even find some evidence! Stay tuned for Squatchin’ with the Daughter, Expedition 2! Bear crossing caught on dash cam. Some hazards of Sasquatching: evidence that isn’t. 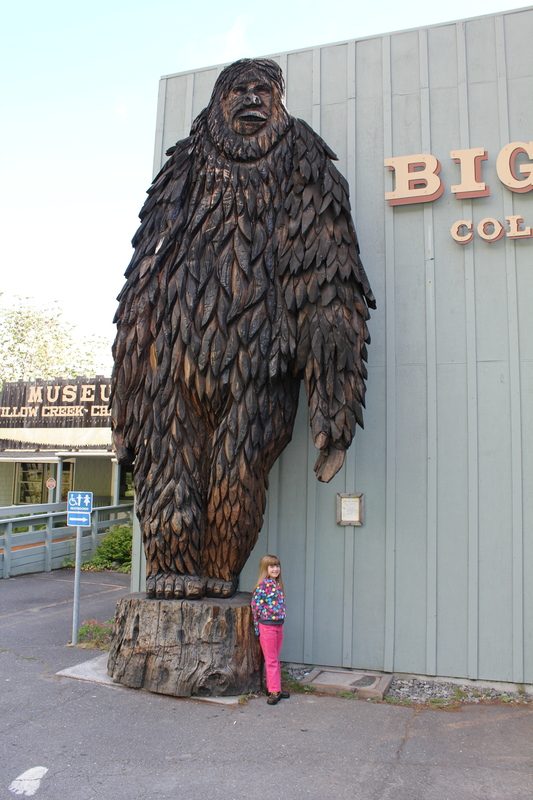 Squatchin’ with the daughter: Expedition 2, part 2 – The P/G Film Site!